NGC 2170 is a dusty reflection nebula and stellar nursery that formed about 8 million years ago, located at the edge of the giant star-forming molecular cloud Monoceros R2, some 2,700 light-years away in the constellation of Monoceros. In fact, NGC 2170 is just the white-blue nebula center left, while this region of more than 15 light-years across, displays a mix of nebula types. 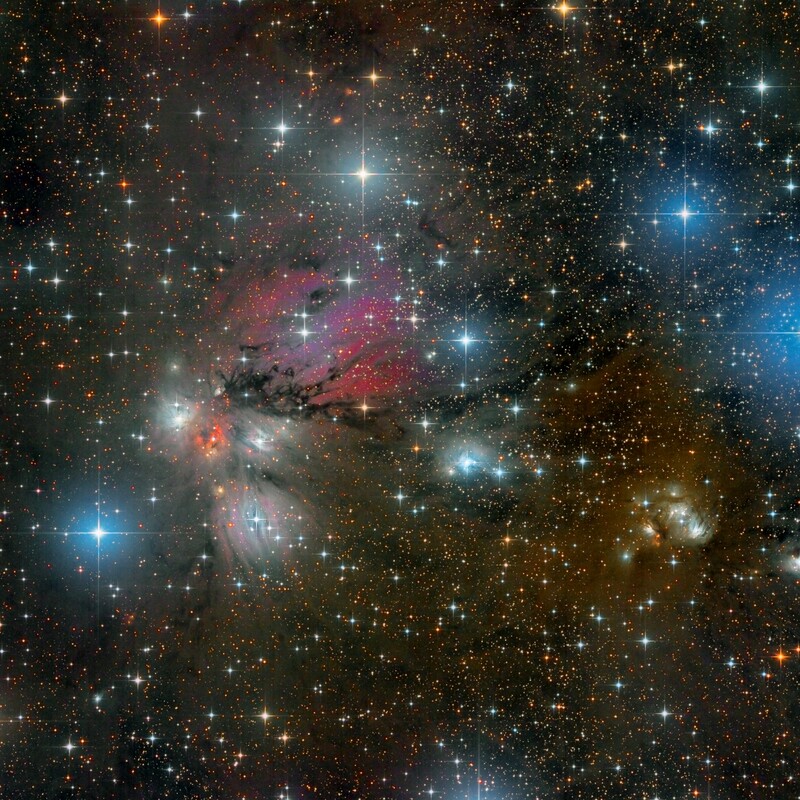 The bluish areas are reflection nebulae, so-named because they reflect the light of nearby hot stars. The red areas are emission nebulae, and shine because ultraviolet light from nearby stars excites hydrogen and other gas atoms in the nebula, which then emit light of their own in specific colors. What looks a bit like black ink spilled across the image are dark absorption nebulae, and are only seen because of the light that they block. Finally at the right side of the picture are NGC 2183 and NGC 2185, two reflection nebulas embedded in the brownish molecular clouds. Overweldigend mooie foto Bart, gefeliciteerd.